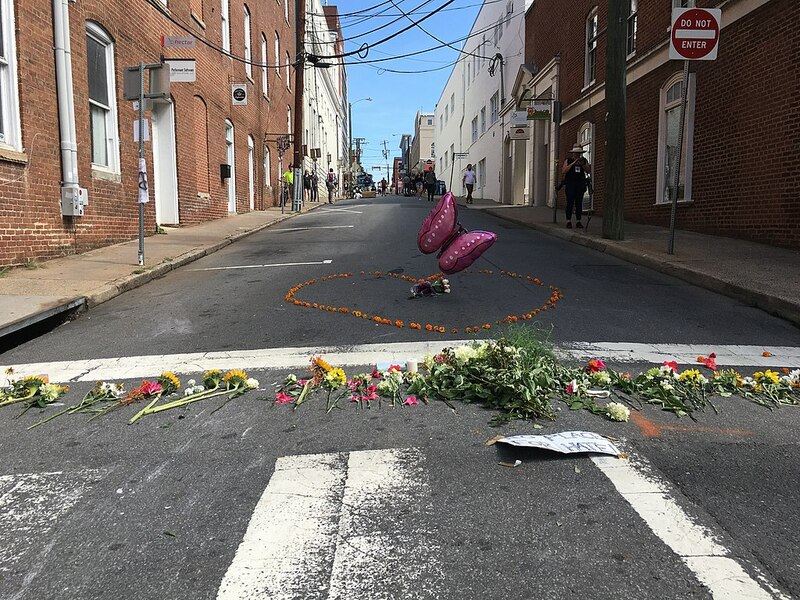 Memorial for Heather Heyer, H. Jay Cullen, and Berke M.M. Bates in Charlottesville, VA. Photo by Evan Nesterak. In Barcelona, several years ago, I attended my first bull fight. Contrary to expectation, I was bored. I got no thrill from seeing a tired bull teased by a red flag and pricked, over and over on its back, by a dancing, prancing toreador proud of his tight thighs and figure-revealing black pants. No real contest in that arena, just a playing out of chest-beating bravado and foregone conclusions, similar to the recent demonstration in Charlottesville, except that the latter produced not a scripted death in the afternoon, but an unscripted one. Hemingway, the flamboyant writer famous for a toned-down, laconic style, was, ultimately, a seeker of battlegrounds and enamored of winning. His masculine, dispense-with-all-extra-verbiage style is famous for several masterpieces, including one about besting bulls back in 1932, when America, a perennial winner of external wars, was stuck in a Depression that took a victory to end. James Alex Fields, Jr., who, like Hemingway, comes off as a man given more to action than words, was born in Kentucky at the end of the 20th century. Even as a boy, he idolized the Nazis. They were winners, heroes, no matter what history said. Perhaps feeling unappreciated, maybe even like a cornered bull with no way but forward, Fields plunged his car into a crowd of Charlottesville protesters. In exhibiting his rage for all to see, Fields is said to have given a young woman a public death in the middle of an afternoon thronging with crowds, rooting for one side versus another in a pitched contest. Fields had cronies who were not behind the wheel but out on the street proclaiming their right to do and say whatever they wanted. Emboldened by recent election-era rhetoric, they were convinced that the country was theirs to dominate as they chose in the public square. They were the strong ones, they believed, the ones who could command the space they occupied and mark it with blood. That was their calling card: Blood and Soil. They had power and might on their side and they could take the blood of anyone who did not look like they did. They could push them underfoot and bury them deep in the soil on which they, the emboldened ranks of the supposedly mistreated, stood tall. They were asserting and establishing a claim to what they considered their right and entitlement: fists and power. And yet, on the face of it, Heather Heyer, who lost her life to collective rage, was one of theirs, albeit a woman, standing up for her right to believe as she chose. The rally was a coming-out party in support of the symbols and images of manly Confederate heroes filled with bravado and desire. The southern park statues mounted high symbolize a victory that was not actually won, but symbolically achieved in the media, first in print and novels and then as film. Two major blockbusters, The Birth of a Nation from 1915 and Gone with the Wind from 1939, debuted less than a decade after Hemingway published Death in the Afternoon. And now cable is getting in the act, packaging a show backing the untruth of a Confederate win and an undying slavery, fictions that a contemporary public is awaiting, perhaps as avidly as the Spaniards in the bullfight arena, where winning is a staged performance, particularly thrilling and emboldening to the young and credulous.